I loved the prequels but not the sequels. Like many sci fi lovers I read Frank Herbert’s Dune–a book I loved for its richness and detail with all of the subcultures, traditions and intrigue centered on the spice–the eye-blue-ing, mind-altering and space-bending drug of drugs. Add the aristocracy and royal “Houses” murdering, betrayal, plots within plots and I did little else but read for days. It seemed that sequels were not as compelling and when Herbert died, I assumed a grand story was finally done. Then the “prequels” came out and I was delighted with how engrossing they were. Each House has its own saga leading up to Dune and then, more in prequels to the prequels with three novels detailing the machines. 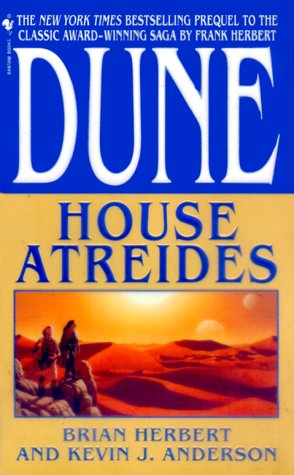 House Atreides was the first Dune novel other than the original that I really liked. Now if they would just come out with a decent DUNE movie . . . You’d think if they could do justice to The Lord of the Rings that someone could figure out how to bring DUNE to life. The first film was a big mess and the TV miniseries was pretty icky. In the meantime, if you haven’t read DUNE, I hope you’ll take a look. It grabs you on the first page and like all good fiction transports you to a different realty and DUNE is a really different, layered mystical place. Peter Jackson, fly me to the DUNE please.